"A sheltered princess and an arrogant swordsman must escape the unraveling of an empire." Stage right is Mai, a princess whose entire world took a plunge with her father off the balcony, who is now a liability for the factions battling over the carcass of her father’s empire. Stage left is Broken, an arrogant swordsman who becomes Mai’s self-appointed bodyguard because he seemingly has nowhere else to be. And he’s skilled enough that he should have somewhere else to be, which means he might be on the run for entirely separate reasons. Dynasty's Ghost has not been tagged yet. 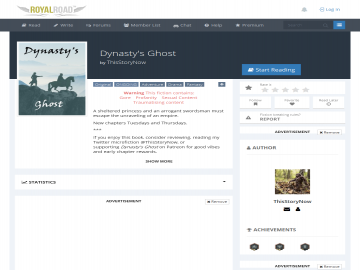 Help others find Dynasty's Ghost by tagging it! Dynasty's Ghost has not been reviewed yet. Dynasty's Ghost has not been recommended yet.